Linnaeus marvelled at the remarkable landscape on Öland. Photo: Hans Odöö. On May 15th, 1741 Linnaeus set off on a journey of scientific exploration on behalf of the Swedish parliament. The destination was Öland and Gotland where it was thought that Linnaeus would make discoveries that would help to strengthen Sweden's economy. China was imported at great expense: perhaps Linnaeus could find clay suitable for making china in Sweden? Plants for dyeing cloth were also to be looked for. Six well-chosen students accompanied Linnaeus on his journey. Together they explored the flora on Öland and were impressed by the great number of orchids found. During their three weeks on Öland they found time to examine everything from runic inscriptions to the enormous appetites of the locals. Linnaeus visited the Karlsö islands and then reached Gotland. Visby reminded him of Rome (where he had never been). Among all that fascinated him on Gotland was the profusion of birds. 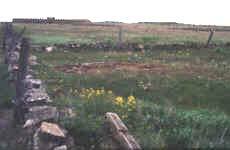 On the little island of Fårö he noted that the peasants even put up nesting-boxes near their houses. Why? They wanted to listen to the bird-song! The number of handsome fossils found along the beaches interested Linnaeus who thought that it was unnecessary to go abroad to purchase art collections at great expense "here everyone in the world might get himself a cartload". Linnaeus hated sea voyages and was often unlucky with the weather. When he left Gotland a month later he wrote :"The North Wind started to frighten us, the waves were like furies, the vessel was thrown between the roaring waves. My comrades were sick. …, desperation took hold of our hearts and we laid our lives in God's hands." 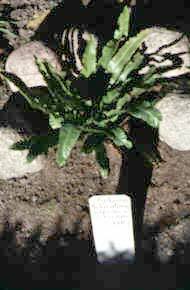 Hart's tongue fern Asplenium scolopendrium is a rare plant that Linnaeus found in a cave on Lilla Karlsö, off Gotland. He took it with him to his garden in Uppsala. A result of the journey to Öland and Gotland was that Linnaeus discovered more than one hundred species of plants that were hitherto unknown in Sweden, for instance Sickle Medick Medicago sativa ssp. falcata which, according to Linnaeus, could probably be used for fodder instead of lucerne which had to be imported. He also encountered different methods of farming, local cures for illnesses and much else. Linnaeus wrote "Returned home in the autumn with my mission well accomplished." However, he found no clay for making china.